Confession: I just ate half a loaf of bread for lunch. It’s true. I didn’t mean to, it’s just that I’d been planning on making it for days but kept forgetting to, so when I slid the pan out of the oven, rapped on the crusty, brown loaf, and finally cut a slice, dipping it into my split pea soup, well, I just couldn’t stop. It was love at first bite, or something like that. 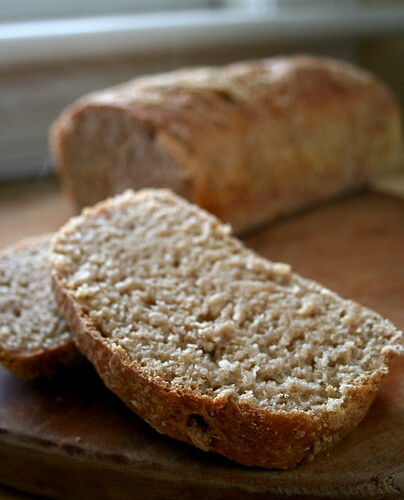 The recipe, “No-Knead Multi-Grain Peasant Bread” adapted from Artisan Bread in Five Minutes, was posted by The Kitchn right before WWIII hit. My plan was to make it this past weekend while I was snowed-in in Lynchburg (I cook for 2 now these days–it’s a nice switch; we’ll call him “the photographer” when a reference is needed), but I never got around to it. It’s silly, given how simple the recipe is–no-knead and all–but the ziploc bag full of flour never made it into a bowl or an oven. So last night I prepped the dough, let it rise this morning while I swam, and then baked it as soon as I got home. That’s when the insanity began. Right now I’m not letting myself leave my office and walk downstairs for anything–I know I’ll just end up with another slice in my hand. It’s everything The Kitchn promised–simple, easy to make, and nutty with a fairly soft crumb. Honestly, it’s not my favorite bread–no-knead breads rarely are–but it’s a perfect solution for a simple loaf. Just remember to actually make the dough the night before, otherwise you’ll just be staring at a bag of flour wishing you had a loaf. In a small bowl, proof the yeast in 1/4 c water with the sugar. Meanwhile, in a large bowl, mix together the flours and salt. Add the proofed yeast and the remaining water. Stir in the water to form a thick, gloppy batter. Cover the bowl and let it sit at room temperature for 8 hours or overnight. The following morning, shape the loaf on a lightly floured surface. Cover and let the loaves rise for about 1.5 – 2 hours at room temperature, until nearly doubled in bulk. A half hour before baking, preheat the oven to 450°. Put a pan in the bottom of the oven to preheat as well. When the loaf has risen, quickly cut 1/2-inch slashes in the top with a serrated knife and set it in the oven. Pour a half cup of water into the pan at the bottom of the oven and close the oven door. Bake for 30-35 minutes, until the loaf is dark brown, sounds hollow when tapped on the bottom, and the interior registers 190° on an instant-read thermometer. Allow to cool fully on a rack before slicing and eating. This looks delicious! I really need to get on the bread-making train…..I keep seeing these beautiful, home made loaves everywhere and it’s making me jealous! Multigrain is my all-time favorite sort of bread to both make and eat; they’ve just got it all going on! Sort of like a loaf-version of an everything bagel. I’ve actually never made the famed no-kneed bread, so perhaps this is my calling to try. I would definitely start with your recipe, for sure! mmm bread . i just started randomly baking bread myself . i look at the picture on the site of how the bread is supposed to come out and then i look at my loaf and frown , but for all that it’s still so delish ! so how much snow you got out there right now ? is it really the snowpocalypse and/or snowmageddon ? hiya, Jes! hooray for awesome bread, swimming, and “the photographer”! you know that’s one helluva bread if you downed half a loaf – mmmmmmmmm! i’m gonna have to make this for dan, we haven’t had soup in forever and i’m thinking we need to, so i’ll make something gluten-free for myself and your no-knead multigrain bread for him. yay! I am salivating over that photo, I’d def eat half of it for lunch too. Can’t wait to see you soonish– hope the weather holds out for hiking. If not, we can stay indoors and bake another one of these and split it for lunch.